Sicario – How Bleak is Too Bleak? 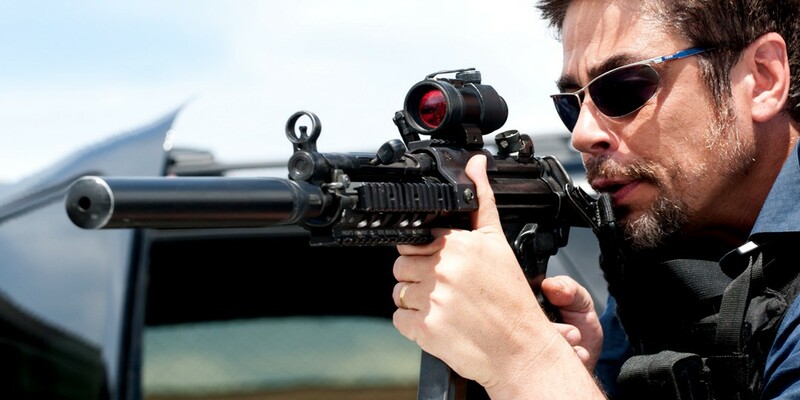 Sicario’s “Alejandro,” unwilling to be a victim. Sicario is a beautifully shot film, orchestrated by director Denis Villeneuve and master cinematographer Roger Deakins. It has a fine script, well acted by the cast, with Emily Blunt and Benicio del Toro standing out in the leading roles. As much as I appreciated it, though, I didn’t enjoy it. Why not? Because it’s also an unremittingly bleak film, with nary a chink of light to be seen. That it’s so bleak shouldn’t come as a surprise. This is a film about the murderous violence of the drug trade along the U.S.-Mexico border, where gangs can abduct and murder 43 students without much in the way of effective repercussions. That level of violence is brought home in a grisly opening, where a raid on a drug gang hideout reveals a charnel house on U.S. soil. This discovery sets FBI agent Kate Macer (Blunt), leader of the raid, on a journey into the heart of darkness. Determined to strike at those responsible for the horrors she’s seen, she signs on with a shadowy task force, a decision that she comes to regret. It’s the kind of part that Blunt can play in her sleep—tough, earnest, yet vulnerable—and up until the latter part of the film, it’s also a part that could have easily gone to a male star, which is pleasing for other reasons. Yet through the course of the film, she’s slowly stripped of her agency as the depth of depravity in the world she’s entered overwhelms her. The tradition in play here is straight from Joseph’s Conrad’s Heart of Darkness and its excellent cinematic recreation, Francis Ford Coppola’s Apocalypse Now. They too stripped away the veneer of civilisation to reveal the barbarity lying beneath the skin. Yet Blunt, confronted with a world where the only options are to be predator or prey, finds herself unable to make a choice and is relegated to the latter category by default. Given that she’s been an audience proxy throughout the film, kept in the dark just as much as we are as to what’s truly going on, this works as a metaphor for how the drugs war turns everyone into a victim or a perpetrator, but dramatically it leaves her inert. Instead, the driving forces behind the plot are two predators—Josh Brolin’s smug “consultant” Matt Graver and Benicio del Toro’s haunted specialist Alejandro. Both hide who they truly are, but at the risk of excessive spoilers, it’s del Toro who takes over the narrative by the close of the film and renders judgement on Blunt’s failure to adapt to the world she chose to enter. Never a hero, he becomes the protagonist, dispensing what some of the people I saw the film with described as “justice,” or at least the only kind of justice that such a world offers. Which is where we circle back around to the bleakness. As mentioned, Blunt started the film as an FBI agent leading a raid on a drug den. Thus she was, in a world still civilised, a third category of person: a guardian. The world that the film presents us with has no room for such people. Some among them choose to accept the reality and become predators themselves, whereas the rest are simply victims like everyone else. I can’t fault the film for presenting this world, as it clearly intends to do so. And, in addition to Deakins’ always wonderful cinematography, it sustains a level of tension throughout, heightening it at just the right moments. A claustrophobic chase through a smugglers’ tunnel and a shootout in the middle of a traffic jam provide expertly directed and nerve-shredding high points to match the initial raid on the drug den. It’s an excellent film, and it will probably win awards in the upcoming season. It will deserve them. But as much as it made me think, and as little as I can find to criticise about it, I didn’t enjoy watching it. Nihilism leaves you with nothing to hang onto, in the end.